Cats Galor large Linen TeaTowel with a very collectable cat design theme to compliment the popular design by Ulster Weavers, a generous size equally good display piece as for use. 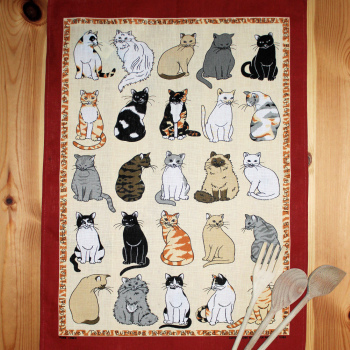 Cats Galor large Linen TeaTowel with a very collectable cat design theme to compliment the popular design by Ulster Weavers, a generous size equally good display piece as for use. A quality linen tea or drying towel with a popular original cats design produced by Ulster Weavers of Belfast, derived from the ever popular designer range. These linen tea towels are a generous 76 by 50cm in size, larger than most drying towels and made from finest cotton. Cats Galor large Linen TeaTowel with a very collectable cat design theme to compliment the popular design by Ulster Weavers, a generous size equally good display piece as for use. A quality linen tea or drying towel with a popular original cats design produced by Ulster Weavers of Belfast, derived from the ever popular designer range. These linen tea towels are a generous 76 by 50cm in size, larger than most drying towels and made from finest cotton. 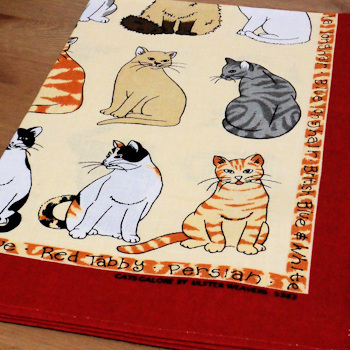 This tea towel has a burnt orange border and white background with a collection of cute cats of all varieties sitting watching for their owner. The quality is assured, Ulster Weavers being receivers of the Royal Warrant.